Here’s a video Wanbra took of me trying out various lines to set up the placement of the rear clipping zone.. the fact that the AE86 had a badly leaking exhaust manifold and a stuffed up flexi exhaust joint (strangely, the thing unraveled into a ball of wires inside the joint itself) didn’t help one bit with the power hence the clutch kicking(s) during mid drift. The in car video shows how hard it is to turn the steering. Unlike my AE86 coupe, the hatchback has unusually tight/hard steering action..I’ve tried everything from changing steering racks, reducing caster and chamber to changing lower arm but to no avail. Even AE86 experts such as Ivan Lau and Charlie are at the loss at offering a solution. So if anyone out there who could help…One thing good though, my arms are super tone from the work out . 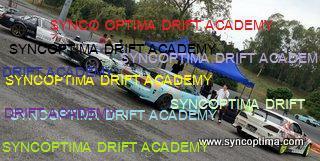 This entry was posted in Drifting, Sync Optima Events, Yon-A and tagged ae86, perak super series on January 29, 2009 by skagee. Perak Super Series : the Drift challenge incident.. I have to admit, this is only the second time I’ve been to the Dato Sagor track in Kampung Gajah but during both occasions I always had and always will, have the impression that the inhabitants of this serene kampung were nothing short of being the most hospitable and friendliest bunch of people I have ever met. Locals were ever so helpful whenever we were at the track; offering to buy us meals or drinks , helping us carry our tyres during changes even after we insist them not doing so. In fact, when Cheaka had some issues with her wheel spacer , one of the workshops nearby allowed us full excess to his tools and bolts without even batting an eye lid. Here are some photo taken of Pasir Salak Resort where we (Wanbra , Dzal , Cheaka and I) stayed for 3 days and 2 nights.A kampung style chalet , located in a middle of a village , across the river from the track ..
Cheaka by the pool over looking the river.. Authentic looking kampung style chalet…the only problem is every chalet looks the same..needless to say if it weren’t for the numbers we wouldn’t have been able to find our way back.. This entry was posted in Rambling, Sync Optima Events and tagged dato sagor, drift, drift challenge, Drifting, malaysia drift, malaysia drifting, perak super series on January 13, 2009 by skagee.